Daniel Levy, M.D., director of the famed Framingham Heart Study, will deliver the seventh annual Meredith S. and John A. Oates Lecture in Clinical Pharmacology on Thursday, Nov. 14. 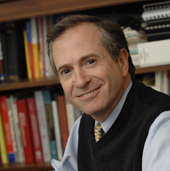 Levy’s lecture, “Unraveling the Mysteries of Heart Disease: Lessons Learned from the Framingham Heart Study and Future Directions,” begins at 8 a.m. in 208 Light Hall. Branch chief of the Population Sciences Branch of the National Heart, Lung, and Blood Institute (NHLBI), part of the National Institutes of Health, Levy is spearheading a new program to identify biomarkers and pathways involved in cardiovascular disease. The program, called the SABRe CVD Initiative, for Systems Approach to Biomarker Research in Cardiovascular Disease, will use gene expression profiling, discovery proteomics and metabolomics to mine the Framingham Study’s comprehensive genetic and phenotypic databases. Begun in 1948 with the examination of the first volunteer, the Framingham Heart Study initially followed about 5,000 residents of the central Massachusetts town, and documented the link between hypertension and coronary heart disease. The first long-term study of its kind, it has continued to follow the children and grandchildren of original recruits. Its prediction algorithm — the Framingham Risk Score — is still used today. Risk factors include age, gender, total and HDL cholesterol, diabetes, smoking and systolic blood pressure. Levy earned his M.D. at Boston University and completed a research fellowship in cardiology before joining the NHLBI and the Framingham Heart Study in 1985. He became the study’s fourth director in 1994 and currently is a professor of Medicine at BU. The Oates lecture is named for John Oates, M.D., Thomas F. Frist Sr. Professor of Medicine, professor of Pharmacology and founding director of the Division of Clinical Pharmacology, and his wife Meredith.